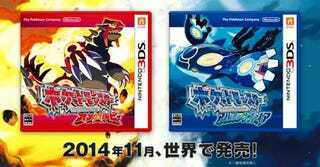 In 2014, Japan saw the release of big Pocket Monster games Pokémon Omega Ruby and Alpha Sapphire. The games sold a ton in Japan, but not enough to reign supreme. A new challenger has taken the crown: Yokai Watch. That's right, Famitsu is reporting Yokai Watch 2 outsold Pokémon ORAS in 2014. What's interesting about this comparison is that both games were for the Nintendo 3DS and that both had two editions (Yokai Watch 2 was available in Yokai Watch 2 Ganso or Honke, while Pokémon came in Omega Ruby and Alpha Sapphire). Another thing to keep in mind is that, of course, ORAS is a remake, while Yokai Watch 2 Ganso/Honke are new games. But, if you are doubting Yokai Watch's popularity in 2014, the fifth* biggest selling game was Yokai Watch 2 Shinuchi, a new version of Yokai Watch 2. It went on sale December 13 and sold 2,007,327. What's even more impressive was that the sixth biggest selling game in Japan in 2014 was the first Yokai Watch game, which originally launched on July 11, 2013. This past year, it sold 994,346 copies in Japan. Of course, that was 2014. Pokémon has an incredibly impressive track record and has been popular for a very, very long time. That doesn't look like it will be changing anytime soon. The question now is whether or not Yokai Watch has the same kind of staying power. We shall see. *The third biggest seller last year in Japan was Monster Hunter 4G at 2.3 million and the fourth Super Smash Bros. for Nintendo 3DS at 2.06 million.